Lv 5 Lava Fist: This will be a skill you will spam the most. It helps gather phantoms quickly! Lv 1 Ice Fist: Another skill that you will be spamming to do dps and gaining phantoms. During [Evasion] process, it can be casted by pressing [Normal attack]. If [Normal attack] is press again, it will trigger [Lava Punch]. Lv 5 Fire Wall: One of your many dps skills. You can hit up to 3-5 times if the boss is huge. Try Luring small bosses to a corner so that fire wall can summon like 3-5 of them on it. Lv 1 Lava Explosion:A Very very Large aoe + Very Quick (Also Laggy). Useful for clearing huge mob groups. Lv 1 Eureka: Best Passive ever. I got it cause Increase own Int according to the number of phantoms. Each phantom increases 1% int; reduce 1.5% dmg received and 1.5% mag dmg received. Lv 1 Alchemy Phantom Strengthen – Dark and Healing Element: Skill needed for your lv 40 ultimate. It increase the amount of phantoms you get from using the dark tree skills. Lv 11 Injector : Requirement to unlock injector EX. It heals 2% per hit. So if you like 20k+ with injector you’ll heal yourself like 400 hp per hit. Ex version is 3% per hit and heals all your party members too. Lv 8 Mixed Infections: Big Aoe and Large damage. It posion the enemy for 10 secs. Lv 4 Disease: I use this skill to get Poison break! Decent aoe and damage too. lv 2 Love Virus: Make the monster go gaga over you. They’ll hurt there own kind too! This skill is freakin deadly in PVP. There was this guy who got my friend with this skill.. He typhoon his whole team xD. Lv 1 Heal Shower:Current this skill is bugged I don’t know it true power yet. Injector EX:This passive upgrade allows you to heal your other party members now! Lv 1 Ice Hand: I got it cause of knockback produced by it, very usefull for pushing you back if you get crowded by mobs or knocking back mobs. Lv 1 Ice Pond: A Very very Large aoe + Very Quick. Also it burns monsters too. Your 2nd lv 40 Ultimate. Lv 6 Slime Healing: Basically slime explodes and covers u in healing wave. Heals 7.5% of your hp when the 60 seconds are up. Use cocktail to boost it even further. Reason I increase was due this being a support build, I wanted all my healing and buffs maxed. Lv 11 Injector : Requirement to unlock injector EX. It heals 2% per hit. So if you like 20k+ with injector you’ll heal yourself like 400 hp per hit. Ex version is 3% per hit and heals all your party members too by 8% of your damage.Lv 1 Sleep: Useful in pvp and pve. Only got since I’m going support I need some skills that cripple monsters. Can active by using it after injector using [Normal Attack] Click or when getting attacked. Injector EX: This passive upgrade allows you to heal your other party members now! This bug allows you change the element of the slime to fire, ice, dark, and light. To preform this bug you must active summon slime and then instantly cast one of these skills. Injector for light slime, Posion Bottle or Posion break for dark slime, Lava Eruption, Flame fist, or Fire Pillar for fire slime, and then Ice Massing or Ice fist for Ice Slime. It like Alchemist own form of 100% attack reduction Devastating Howl that last for 6 seconds. Imagine you where time accel during gdn and sdn… were talking about long moments of no damage which is excellent in these nest runs. * SDN is not effected by this skill but mini bosses are. Welcome to the equipment section here I suggest what gear you should have every 8 levels. Also I’ll suggest what Hidden Potentials you should get. Crafts you should get at Lv 24: Full Intellect crafts except for gloves since it can’t get intellect get Sturdy craft for it. 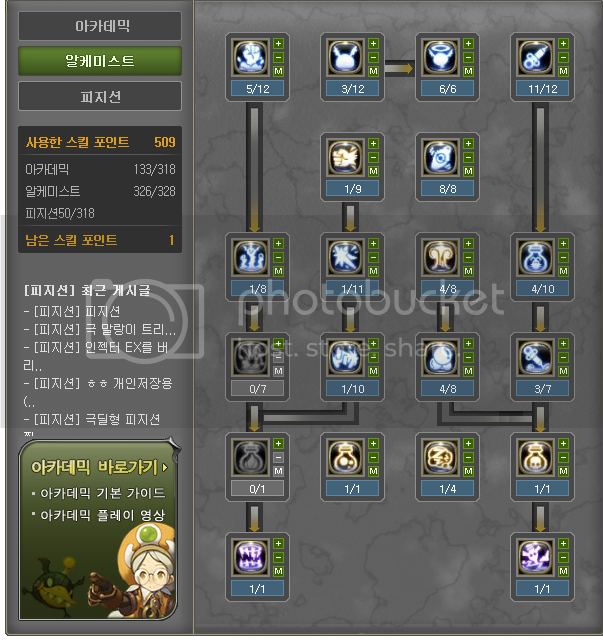 Crafts you should get at Lv32:Full Intellect crafts except for gloves get Mana craft for it or sturdy if you want. For Weapons get both Magic crafts on them. Crafts you should get at lv 40: Full Life craft except helmet get Intellect craft for it. Then weapons Magic Craft. (Life Craft on one the weapons if you want more survivability in hard nests) or you can get 3 Intellect crafts and 2 life craft parts, it up to you really. 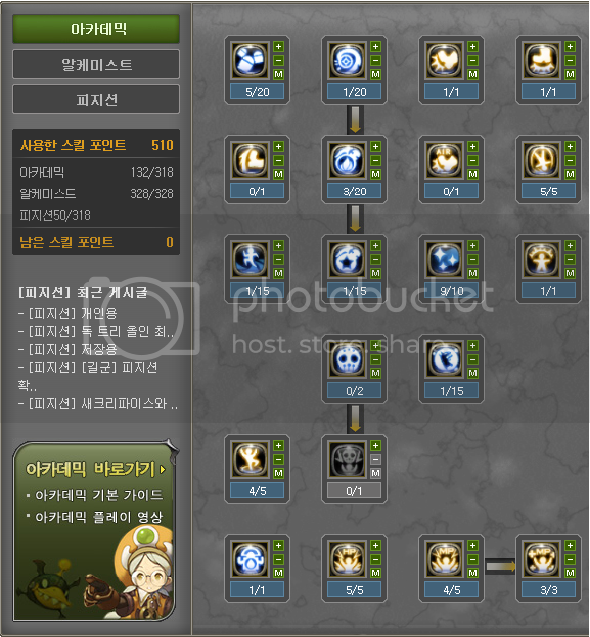 Crafts you should get at lv 50: Full Life, I, or II craft except helmet get Intellect, I, or II craft for it. Then weapons Magic Craft. (Life Craft on one the weapons if you want more survivability in hard nests) or you can get 3 Intellect crafts and 2 life craft parts, it up to you really. If you want to boost your healings and such, you may use these gears to your advantage. L-Rank Seadragon gear: Try getting 5 or all the part, you must get the weapon and the sub weapon. Try +13 the weapon and the sub weapon, and try to get light attack+ magic damage pots on them(This is used to increase injector damage) while the armors try to get +10 or +12. L-Rank GreenDragon gear: I have not seen any Koreans post up L-gdn in the blue bird so I currently don’t know it true potential yet, but I do know this they all come with old suffix system allowing you to gain more stats then usual+ I don’t know if you can mixed the sets up to get the set stats. So for now this will left blank. Immortal Set: Wait why are choosing this set, because it gives the most raw damage from any A set that was made so far basically this is like a hybrid set where you can do amazing dps with it if you know how to use it correctly. Hidden Pots that you should get on Necklace and Earring Rare/B-Rank are: INT AGI HP, INT and HP, or INT. Hidden Pots that you should get on Necklace and Earring Epic/A-Rank are: INT AGI HP, INT and HP, Or something that INT in it. Hidden Pots that you should get on Necklace Earring Purple/S-Rank are: INT AGI HP, INT and HP, Or something that INT in it. Necklace and Earrings: Windswept with INT or VIT(If you want to survive long) or Both or Skillful Necklace and Earrings with Agi being the main stat or the balance version were the Int and Agi are pretty close stat wise. Necklace and Earrings: Wise with AGI or VIT(If you want to survive long) or Both OR Seadragon OR Skillful Necklace and Earrings with INT being the main stat or balance version. Try aiming for Magic damage Pots on them. Ah plates the most important thing that we need. Here I will explain what plates you should wear :). You can only wear 8 enhancement plates and 4 skill plates.. later on there will items that will allow you to wear more. My Plate Build: Soon to come.